"MOSQUITO NETS AND OTHER INSECT PROTECTION PRODUCTS"
Please shop at our new website! West Nile Virus, Malaria and other serious diseases are transmitted by mosquitoes. The best solution for protection is to wear comfortable Skeeta clothing designed to prevent insects from biting you. 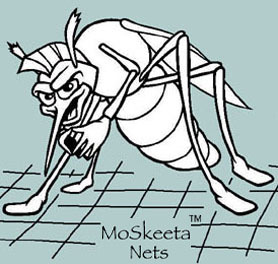 Skeeta products provide CHEMICAL-FREE protection against mosquitoes, no-see-ums, gnats, ticks, black flies, sand fleas, green heads, wasps, bees, ants, spiders and other harmful insects. Get equipped with Skeeta mosquito net jackets, pants, tents, bed nets and canopies, baby crib nets, stroller and carrier covers, no-see-um netting by the yard. Custom net cutting and sewing are available upon request. Skeeta, Inc. proudly provided insect net tents to support and protect US soldiers stationed in Iraq.